Suitable for Rigid Printed Circuit Board, Flexible PCB, PCB legend, Photo Resistance Solder Mask, Wet-Film Plug-via-holes, Surface Mounted Technology, Carbon/Resin Plug-via-holes, and other PCB screen printing. Innovative double squeegee two-way printing, plus bidirectional peel-off and table displacement. Finished both sides printing to dry at once to reduce processing and save energy consumption. Electric vertically up down, fast moving to raise productivity 30% or above, long run durable operation. Save the cost for screen making, fast screen registration to reduce technical difficulty. Equipped with safety bar, safety press bar and emergency stop uplifting cylinder for thorough protection. TABLE SIZE (D x W) 700x900mm 27.6" x 35.4" 700x1200 27.6" x 47"
MAX. PRINT AREA (D x W) 600x650mm 23.6" x 25.6" 600x950mm 23.6" x 37.4"
MAX. FRAME SIZE (O/D, D x W) 900x1100mm 35.4" x 43.3" 1000x1500mm 39.4" x 59"
SUBSTRATE THICKNESS 0~25mm 0~1" 0~25mm 0~1"
A.	German S.E.W. Motor powers screen up / down position and drive motor for squeegee / flood travel. Provides high cycle speed with smooth mechanical movements, low noise and accuracy. B. Printing table surface is CNC precision milled and manufactured from high quality anodized aluminum to achieve close tolerance planarity. Honeycomb construction for rigidity, while offering powerful, heat-dissipating turbine vacuum. Suction force is adjustable for optimum substrate control and printing requirements. E.	Pneumatic frame locking with check valves / airlock and four-sided frame holding assembly ensures rigidity and high stability. F.	Patented mechanical print head lift guided on precision sealed linear motion bearings allows stable, vibration-free movement in up/down positions. G.	Squeegee and flood printing parameter settings for speed, height up/down position and manual travel for set up independently controlled by single action from the touch screen. H.	Includes pneumatic squeegee / flood pressure equalizer control system. Fully automatic and regulated by a constant pressure control system equalized with pivot point balance for angled substrate along with snowplow skew feature for irregular print surfaces. I. Stable pneumatic cylinders are encased around solid cast to allow consistent pressurization of squeegee and flood. After initial setup pressure regulator can be increased and decreased on the fly. For most applications suitable pressure range is 3-4 bars and the squeegee and flood both have pressure indicators to gauge incremental setting amount. J. Touch screen control of peel-off action to assist release of ink and mesh from substrate synchronized with the print stroke in the auto-mode of operation. Flood coat sequence is carried out with the frame in the horizontal position allowing a no peel flood function. This benefit offers more uniform control and evenness of ink layer over length and width of image area. K.	Peel-off height lifting point adjustable by low speed cylinder depending on print stroke and mechanical adjustment to set peel-off height. L.	Mechanical adjustment of off-contact height settings to accommodate substrate thickness 0 - 25 mm (0 - 1”). M.	Print table X / Y movements via precision scaled micrometer control(s) for fine registration. Play-free registration without backlash. N.	Choice of three print functions from touch screen: flooding before the print stroke, flooding after the print stroke and for higher cycle speeds flood while screen lifts to full up position. Includes no flood setting and print head lift for ease of sq / fl load and unload without removing for fast setup. O.	Squeegee / flood assembly is synchronized and changeover is pneumatically operated for smoother transition. Adjustable height controls, angle settings 0-30°, leveling and skew feature. Provides uniform ink deposits across the entire print area. 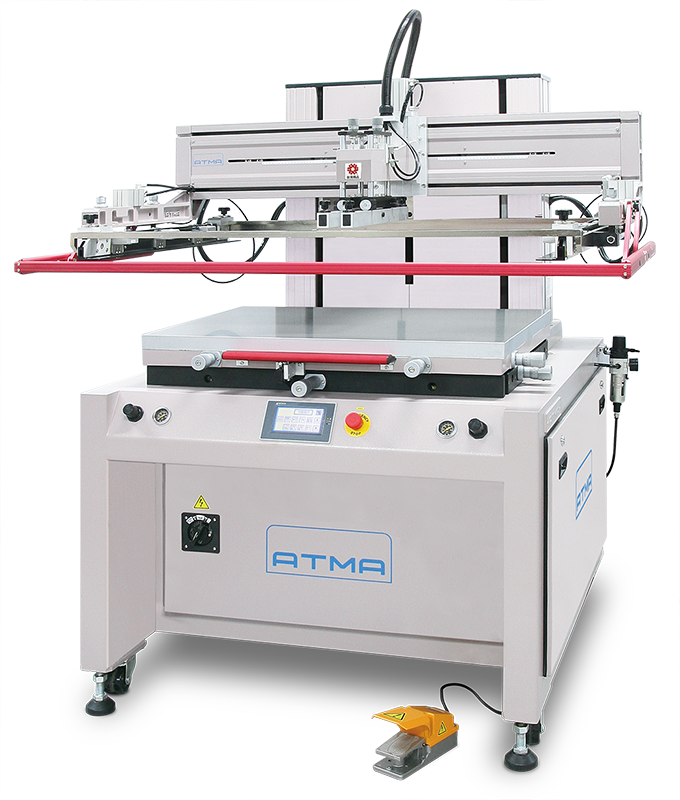 P.	Highly efficient delta servo motor powers squeegee and flood coater with greater accuracy of speed range (acceleration and deceleration) 100-1000 mm/second. Direct numeric input of digital settings for stroke position through touch screen control. Immediate upgrade for 120P, AT-80P and AT-160P will be upgraded after old versions are sold out. Q. Variable and independent print and flood stroke speed and length setting to image size. R.	Productivity preset in numerical values for throughput can be changed anytime. Enter production quantity according to run length and during run the touch screen will indicate current yield until preset number of prints are achieved. S.	Frame loading and unloading from the front of the machine to facilitate fast setup and changeovers. Frame holding rails can be unlocked from touch screen and easily adjusted to the size of the frame. T.	Control system for compressed air supply is an oil free FRL unit to prevent oil mist pollution, applicable in clean room environment. U. Equipped with powerful turbine vacuum control to prevent movement of the substrate. V.	Emergency press plate positioned in front of print table in case substrate alignment is not in the correct position. Operator can press the plate and printing head slowly lifts up to the full upright home position allowing operator the chance to register correctly final substrate alignment. Reduces spoilage and yields more printed product. W.	Front safety bar location on the print head, compliant with OSHA safety regulations. X. Includes 4 squeegee holders and 4 flood coaters, sq. / fl clamps, pedal switch control, toolbox, tools and door key.